We have had some nice encounters with the whales in the past few weeks and have seen some interesting behaviour, including some pretty cool breaching and we even had fun with our whale and people portrait session, as well as lots of singing Humpbacks. there is nothing like floating metres above a singing whale as the sound reverberates through your body. They definitely have a strong set of pipes. Not to mention that we have also discovered a new form of adventure which I like to call swimming with jelly fish in the harbour. trust me we were amused for hours. stay tuned, more to come from Tonga. Tonga is one of only a few places in the world you can swim with Humpback whales. And the regulations state clearly that only 4 people and a licensed guide can be in the water with the whales at any one time. 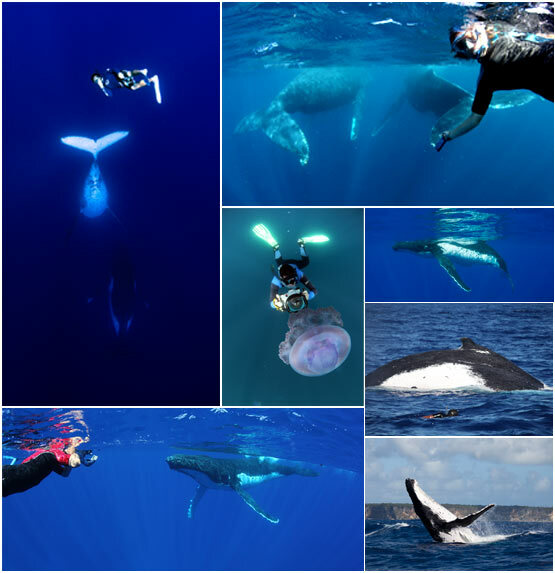 We don’t scuba dive with the whales, only snorkel and practice a soft approach to interactions with these amazing mammals. Copyright © 2007-2019 All Right Reserved. Swimming with gentle Giants.